Bienvenido a Camping Serenella Bardolino. A tranquil family environment that sits in the uncontaminated nature of the Lake Garda hills, ideal for a relaxing vacation offering sports and health activities. Guests will appreciate its many internal services and structures: animation, piscinas, restaurante, pizzería, bar, supermercado, lavandería, shaded car parking and game-room. And on the beach you can practice water-skiing or paraflying as well as take advantage of a convenient water-taxi service for excursions everywhere on the lake. Instalaciones: we offer, in addition to large, fully equipped and shaded campsites, apartments with views of the lake, recently installed mobile homes, trailers with verandas and quaint little wooden bungalows: a variety of offerings to satisfy all tastes and needs. Swimmingpools: our pools are situated in a tranquil zone, immersed in the campground's gardens. This is the ideal site for an invigorating swim, fun-filled group games and an irreplaceable pastime for young people and children, who have their own pool. The bar is just a few steps away and an area equipped with umbrellas and deck chairs makes our pool zone particularly suited for relaxing and sunbathing. Deporte: a team of sports animators will cheer up your holidays with windsurf classes, canoe excursions, aerobics and many other proposals. The campground also has the following facilities: the C.O.N.I. Federal Water Skiing Center with a school for beginners and for experts; a center where guests can try paraflying and a taxi-boat service for excursions to all points on the lake. Ocupaciones: our animators will fill your days with fun and friendliness, proposing beach tournaments and, especially for the younger set, games and entertainment. Evenings, on the other hand, will fly by to the rhythm of dancing and exhilarating spectacles. Servicios: Camping Serenella facilities include internal parking, beach with lawn and shaded areas, private solarium dock made of wood, restaurante, pizzería, bar, supermercado, fruit and vegetable shop, laundries throughout the entire area and game room. 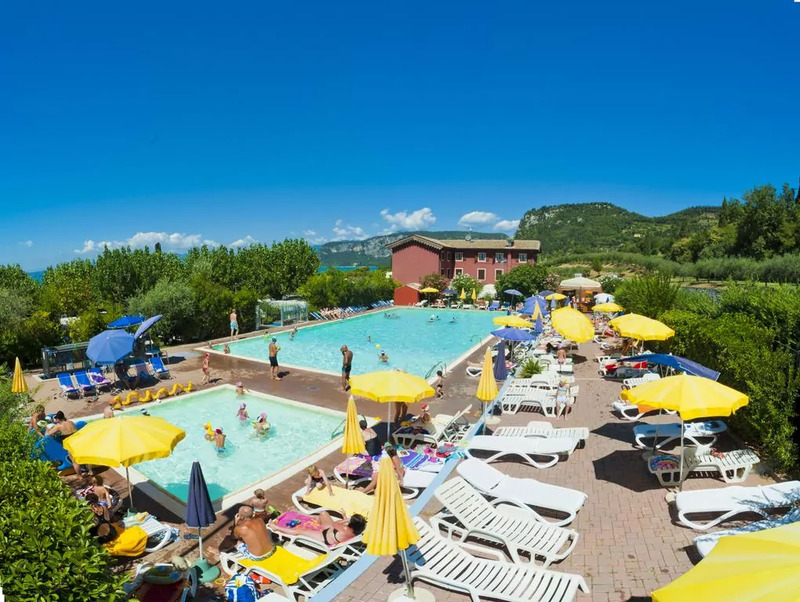 (Camping Serenella Bardolino campings).